was the Great Royal Wife (chief consort) of the Egyptian Pharaoh Akhenaten. 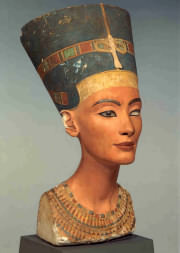 Nefertiti and her husband were known for a religious revolution, in which they started to worship one god only. This was Aten, or the sun disc. She was made famous by her bust, now in Berlins Neues Museum, shown to the right. The bust is one of the most copied works of ancient Egypt. It was attributed to the sculptor Thutmose, and it was found in his workshop. 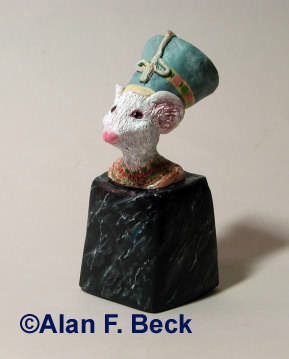 Polymer clay and Acrylic paint 2" x 5"
The Great Royal Wife of the Egyptian Pharaoh Akhenaten.